Somewhere in the dark, dark woods a little spark of red is making her way. Little Red sets off from home, destined for her granny’s house trying to be the girl she’s expected to be. But as the woods get darker and the path more strange an overwhelming urge arises; to step off the path, go into the forest and find out what’s really out there. Little Red is a story about growing up. Reaching the point where we have to make our own decisions. Which path to take? How far to go into the woods……… a flash of fur, the glint of teeth, something out there in the night. Presented by Barrowland Ballet and Tramway, a fun and thrilling show for children aged 7 and up with their family and friends. "Don't miss Little Red. 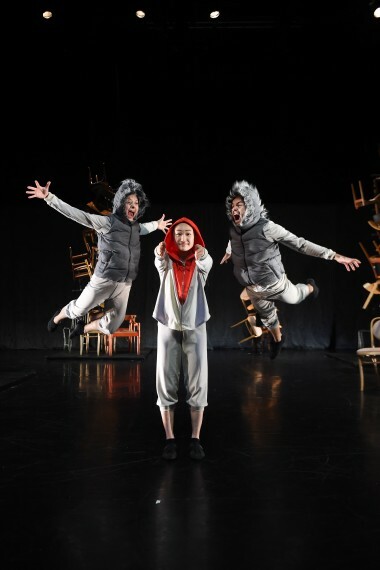 Dark, funny & imaginative- we loved it"
"Loved Little Red- not a tutu in sight! Dark, quirky and funny. Great production.